We do all the things that an offense is supposed to only be able to do out of a huddle: multiple personnel, multiple formations, multiple shifts and motions, and we are able to keep a very fast pace. With some thought and planning, any offense can operate from no huddle very easily. However, that doesn’t mean that every offense should operate this way. I was reading a thread on Coach Huey this morning (here) about coaches who still use the huddle and what they see as the benefits. I don’t believe there needs to be a debate about whether to huddle or not, but I do believe conversations about using multiple tempos from either mode are valuable. Tempo and Procedures Part 2 – Slow it Down? Learn more about our multiple offense here. In the early 2000’s I had a chance to hear Rich Rodriguez speak on his no huddle offense at West Virginia. One of the very first points he made in his clinic talk was that whether he was a no huddle team or a huddle team, he would use multiple tempos to attack a defense. 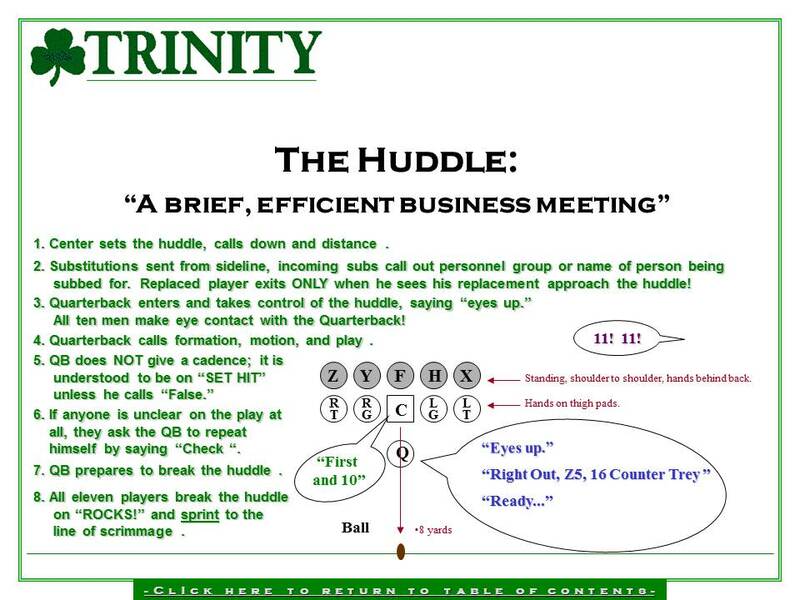 Understand that the debate on huddling versus not has been around since the game was invented. Knute Rockne was not an advocate for the huddle which began to be utilized while he was coaching. He wrote in his book that the disadvantages of the huddle far out weighed the advantages. See it here. In fact the game used to operate without a huddle in its earliest days. I found a video clip from the 1903 Yale-Princeton game in which the ball is snapped four seconds from the time it was spotted. See it here. I think Andrew Coverdale defines the huddle as well as anyone. He and I spoke last spring at length about using no huddle procedures, and he decided to stick with the huddle system. It paid off as Trinity High School in Lousville, Kentucky won the state championship. Early in camp he tried some no huddle but made the decision that it was best for them to continue operating from the huddle as their base mode of attack. You will notice that Coverdale uses multiple tempos from the huddle. 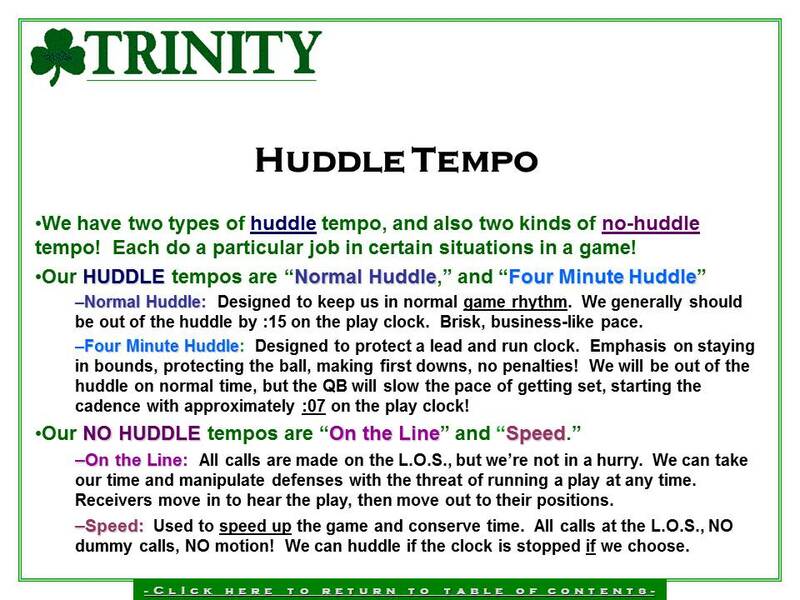 If you choose to be a huddle team, I would argue that you are not getting the most out of your attack if tempo is not a thought in how you attack. You can speed up or slow down just like no-huddle teams do. As I mention in one of my tempo articles, Boise State is one of the best at using fast tempo from the huddle. They change personnel, use multiple shifts and motions and do it as quickly as some no huddle teams. To truly appreciate it, you need to see them play live and watch their operations. We added a huddle back into our offense as we saw both the need and desire to communicate in critical situations and to slow the game down in four minute situations. There is nothing I dislike more than to be up on the ball and waiting and showing the defense our formation for an extended period of time. In our huddle mode of attack we do use multiple tempos. I also believe that mixing in huddle with some basic no huddle modes of attack can be incorporated fairly easily. 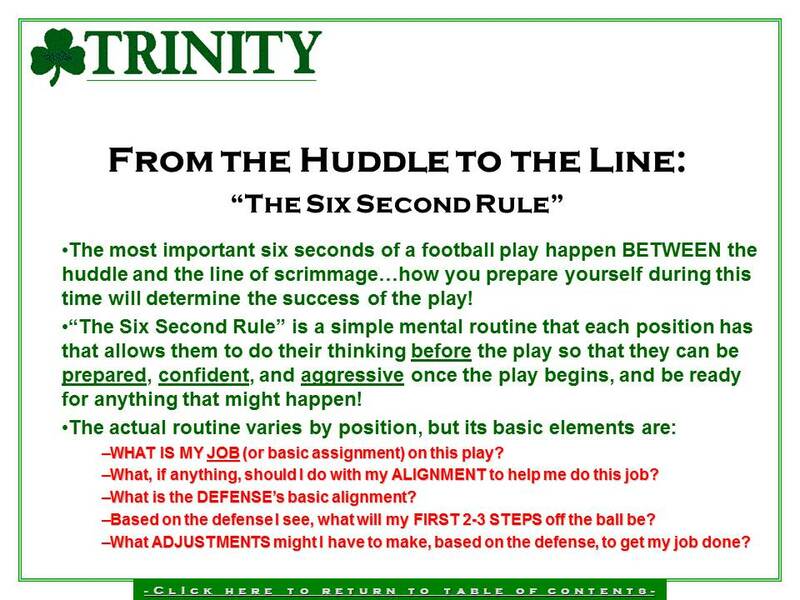 I had several “huddle” coaches speak with me this off season on how they could incorporate some no huddle procedures. We talked about how using a simple scripted series of three plays run in sequence without huddling could put stress on a defense. Incorporating some play action after a sequence of runs could prove to be very effective. See an example here. Other valuable tools for incorporating some uptempo no huddle into your huddle offense would be using “copy” or “opposite” procedures. Don’t outsmart yourself. If a play is working keep the pressure on. Get up to the line of scrimmage as fast as possible and run it again. If the play is to the boundary or field and it’s necessary to run it that way, use a procedure that allows you to flip the formation and play. The other recommendation was that if you have used a series of uptempo no huddle plays, use freeze to get out of it to get a cheap five yards. Have a one word play call prepared to change to a live play if they don’t jump. One word play calls were my other suggestion. To me one word calls and picture boards work in a very similar way. I have a brief post on one word calls here. The idea is to get information to the players as quickly as possible. I prefer picture boards over one word calls as the defense can not tell when the boards are “live” as opposed to maybe keying in on a single word. For a huddle offense, either mode is an easy way to incorporate 3-6 plays each week that you can get up on the ball and attack at a fast pace. 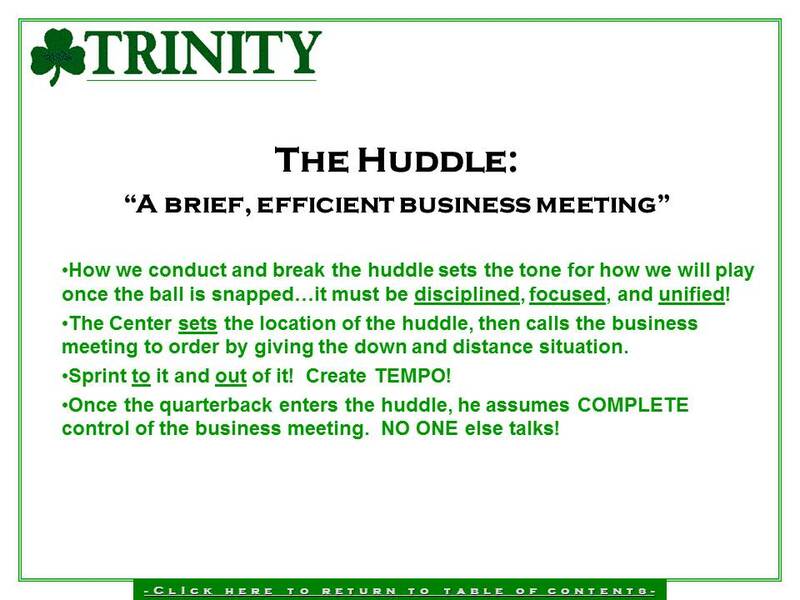 Tempo does not need to turn into a debate of huddle or no huddle. My philosophy is that tempo is part of our attack. It’s something we include in every play call. We even game plan which tempo tools we will use (we have 17 tempo tools). 1. Know what your team needs and is capable of. The best people to answer this are you and your staff. What some “expert” coach is saying at a clinic may not apply very well to your situation. 2. Define your procedures clearly both for your coaches and players. See more on procedures here. 3. Make those procedures part of everything you do. If you expect to use them only on game day and they have not been practiced, confusion will ensue for both you and your players. 4. Have a tempo signaler for every single play and make all eleven players look to the tempo first. This will let your offense know when to huddle, how fast to get out of the huddle, and when to align on the ball and run a play or sequence of plays without huddling. 5. Operate with full game procedures during team periods in practice. Have players handle sideline procedures in practice. Doing it helps them to understand it. Give a player a script and have others serve as signalers or send the play in with a messenger. This will also allow your coaches to stand where they need to view their players. Four verticals is great for one back and pistol teams because it allows for a passing attack that stretches the defense both vertically and horizontally. It’s been a staple in our offense because it allows us to protect our running game by keeping the defense from loading the box. Read my article “Four Keys to a Successful Four Vertical Package” on American Football Monthly here. Here is a list of resources on the our vertical passing concept. If you have others to add, please do so in the comments section. Here is a listing of resources in which the pistol set is utilized. Please feel free to add more links in the comments section. As I’ve mentioned before in my first article in this column, I believe that offenses should be set up to evolve rather than have to make major changes from year to year because of changes in personnel. As part of our evolution, a key component was to find efficiencies in the structure of our system. The goal was to create a system where everything we do is tightly integrated. Within that integration we wanted to find efficiencies and carryover while allowing for flexibility and multiplicity. 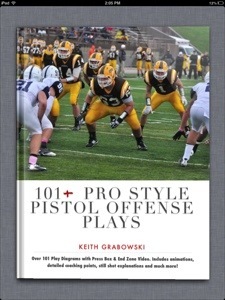 One area which has evolved for us is our play-action passing game. 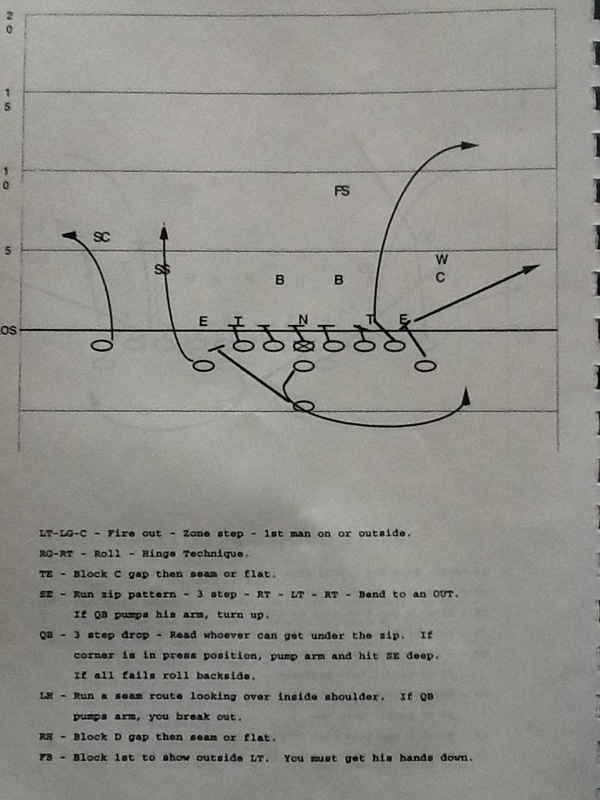 In the past, we had drop back play-action that existed as only one run action with one basic route combination and a variation added with a tag. The structure of the run action protection limited the route combination and therefore our use of what was simply termed “Action Post ” or “Action Post Change.” While these were effective at times, the limitation in the number of looks (formations) made it difficult to integrate into every game plan. In 2001, I learned about a simple concept that paired quick game with naked at a coaches clinic at Carnegie Mellon University. Offensive Coordinator Rich Erdelyi showed how the quarterback could get a simple pre and post snap read for the quick game (hitch or slant) and if it wasn’t there he could roll away to the tight end and wing slam releasing on their naked rules. This combination is gaining popularity. Recently, Matt Kalb, Offensive Coordinator and Quarterbacks Coach at Aurora University, wrote an article on this topic in the March issue of American Football Monthly. Coach Kalb also spoke on this topic at the Glazier Clinic. Minnesota Quarterback Coach Jim Zebrowski also spoke on this topic at the Glazier Clinic in Cleveland. Minnesota had success with what the call “Money” and “Cash” in their offense. Here’s a few clips that coached shared at the clinic. In the first clip the hitch is available and the quarterback takes it. You will see the #2 receiver slanting and then working to 15 on the opposite hash. 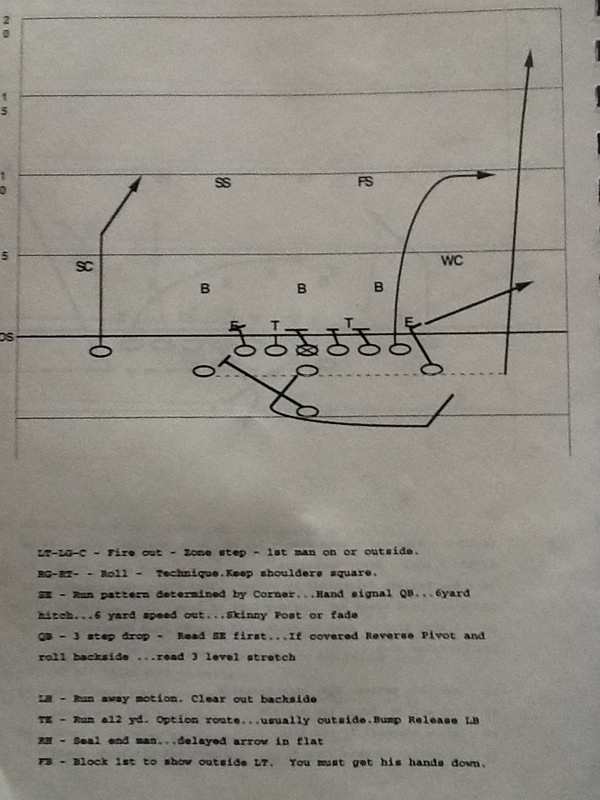 #2 is an option for the QB on the slant on quick timing if the defense gives it to him. The second clip shows the Quarterback taking the quick game as well. In the third clip the quarterback sees defenders covering down and taking away quick game. He pump fakes the quick and rolls away to the naked concept on the other side finding #2 wide open on the crossing route. The best thing about installing quick-naked is that is very low investment. Both components that are paired together-the quick game and naked-are usually a part of most offenses. There is no new learning for players, and the read for the quarterback is very simple. The other benefit is that this preserves an option for the quarterback if the quick game is not there. In a mirrored quick game concept, a QB has the side he has decided to go to pre snap and that’s it. The other side is not available if the pres snap side is not there. Here’s some more video of the concept from Illinois College on Youtube. I’m sure that this is a concept that many offenses will use in 2013.